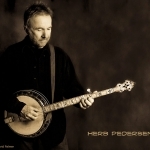 Herb Pedersen began his career in Berkeley, California in the early 60’s playing 5 string banjo and acoustic guitar with people like David Grisman, Butch Waller, David Nelson, and Jerry Garcia. Herb has done well in adding his talents to the recordings of many folk and country music artists of today. With his lifelong pal, Chris Hillman, Herb is in the process of continuing the type of music they both grew up playing and singing. There is a work in progress most of the time and that the way Herb likes it. Artist like Linda Ronstadt, Emmylou Harris, Vince Gill, Johnny Rivers, Dan Fogelberg, Jame Taylor, Gordon Lightfoot, Jennifer warned, John Prine, and Jesse Winchester have used Herb’s talents in the past, and in all probability will continue to do so…..
From Carnegie Hall to the Ryman Auditorium, Herb’s been on the scene enjoying every minute of it.